Here at Nowak Commercial Refinishing we are experts in the field of Fiberglass and Gel-Coat Repair. 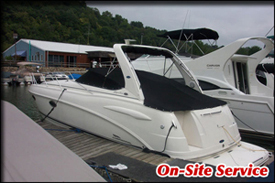 We are marine repair specialists, servicing Western Pennsylvania. Repairing fiberglass is an intricate process that we have mastered. 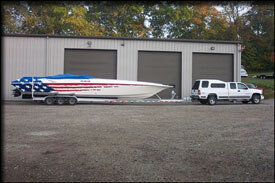 When it comes to your boat or personal watercraft, getting the repair done right is our number one concern. We know that, being a western PA resident, your number of optimal days on the water is limited. Our timely turn around time keeps you off land and on the water. We can handle your largest or smallest jobs in our 14,000 square foot, state-of-the-art facility. Also, for convenience to our customers, we offer on-site service. Have your color band painted and never have to wax or polish again. 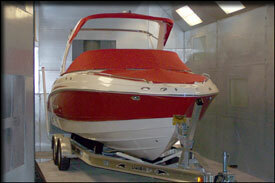 An easy and inexpensive way to make your old boat shine like new again. Making Sure the Repair is Done Right! In our business history we have seen many repair shops come and go. The majority of these repair shops are auto shops. The bottom line is , one can not apply automotive technology to marine applications. We have extensive product testing and know what works and what does not. Chances are the dealership where you purchased your boat or PWC do not have the ability to make the repairs you need to fiberglass or gelcoat. There is nothing that is made flawless, and that is why your recently purchased item may have defects that need addressed. At one point or another, we have worked with most manufacturers in making warranty repair. The best part is the repair is done right at NO COST TO YOU! We are an authorized Direct Repair Facility for four (4) major insurance companies and that list is growing.